Credit scoring is a way that lenders predict whether a consumer will pay on time. This has typically been accomplished by generating a FICO score. 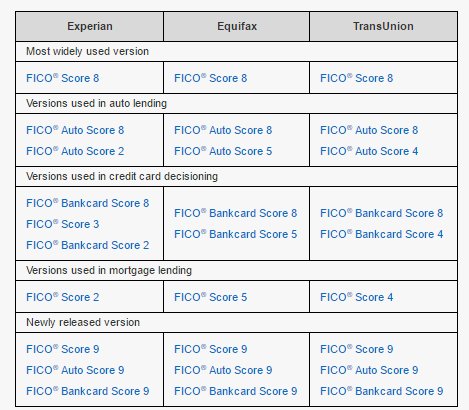 Read more on FICO from previous blogs (scroll down to credit here or #2 here). Fannie Mae has added some new rules to the old FICO game that is expected to eventually create a dramatic shift in the entire credit industry. 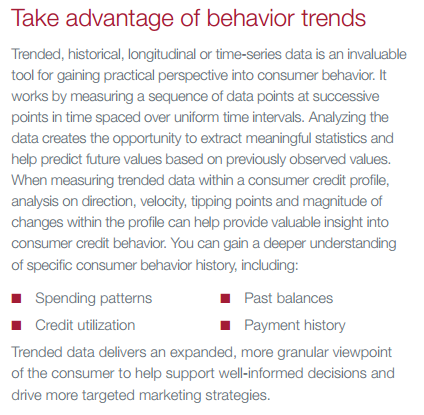 The new “Trended Data” (TCD -- Trended Credit Data – yes, of course we needed an acronym!) report goes into, well, different detail. The new report includes actual payment amounts and, among other things, up to 30 months of account history. Previously, credit reports indicated outstanding balances and notes on paying on time and paying off lines versus carrying a balance. WHEN DID THIS NEW SCORING START? Based on the fine print on the bottom of this piece from Equifax, trended data started, err, trending officially at least as early as 2014. It kind of made me wonder if said Top 25 Retail Bank still exists. That so reminded me of a game we used to play at large annual meetings. Every (interested in being a cynical, nasty) person who chose to play, got a list of buzzwords. The person who circled the most buzzwords mentioned in the shortest time during the meeting won a free drink later that evening. Let’s play a similar game right now. How many buzz words can YOU circle in that pasting above? Your prize is a link to dictionary.com. See, you’ve already won -- just by reading this blog posting! But I digress, as usual … let’s skip forward. WHEN AGAIN – AND WHAT? This sounds much like FICO and credit scores and, yet, it is different. Here’s how the National Mortgage News explains it. "If the borrower pays off their credit balance every month, that is obviously a stronger borrower and demonstrates an ability and willingness to make those payments," said Timothy Mayopoulos, Fannie Mae chief executive, during a recent earnings conference call with reporters. Second, Fannie will be looking to see if the borrower has exceeded their credit limit. A borrower who never exceeded their credit limit is considered less risky than borrowers who have. Trended data separates borrowers into "transactors," who pay off their credit card balance every month, and "revolvers" who make minimum or partial payments and carry a significant or growing balance. "The transactor with a middling credit score has a better chance of getting their loan approved than a revolver with the same credit score," Mills said. Overall, "trended data is supposed to be neutral or expand the credit box for potential borrowers according to Fannie Mae." Craig Crabtree, senior vice president and general manager of Equifax Mortgage Services, said, "This is an exciting time for the industry. It is the first time that the credit report has been changed in 27 years." This past August, CoreLogic issued a four-page FAQ about Trended Credit Data. HousingWire reported in rather pithy style, “Fannie Mae unexpectedly, indefinitely delays use of trended credit data”. That mid-2016 date was wrought with technical glitches and other concerns. Therefore, it was delayed until ... Now. Once all systems had been checked and stick figure drawings complete, TCD finally rolled out on September 24, 2016. In the new words of Housing Wire, “It's official: Fannie Mae moves to open credit box with trended credit data”. 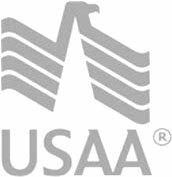 “DU Version 10.0 will provide more certainty and simplicity to lenders while expanding access to credit and sustainable homeownership for creditworthy borrowers by providing enhanced credit risk assessment including the use of trended credit data, automated underwriting of loans for borrowers with no traditional credit, and automated underwriting for borrowers with multiple financed properties. So, what does all of that mean? Per the last blog, again it’s all about the money. Lenders lose (some) money when borrowers default on their loans. Trended Data will eliminate some of those borrowers via their predictive algorithm before they even close on a home loan. 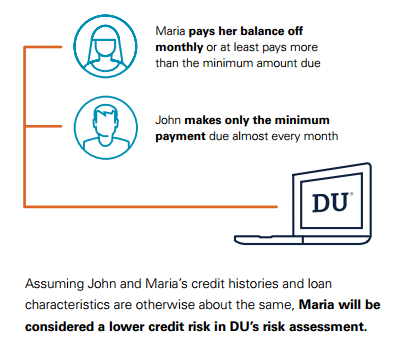 Lenders will, however, pay for their ops staff members to be trained on the new DU. See, for example, “Fannie Mae to Trigger 'Seismic Event' for Underwriting”. Ah yes, higher rates, risk-based pricing, etc. may not apply to those who thought their good FICO scores guaranteed them the best possible rate. An acquaintance told me last week her mortgage application was denied. The reason given was “too many open credit lines”. The lender switched her to an FHA loan instead and she was approved at, yes, a higher rate on a loan that generates higher profitability. Disclaimer: I do not know anything about this person’s finances, payment history, assets, etc. But what little she told me does generate another hmmmm. If this is indeed a Fannie Mae creation, you might assume, some lenders might be tempted, then, to sell loans to Freddie Mac, for example, instead of Fannie Mae. Well, no. In Jersey lingo (as well as some areas of Canada), “fugget about it”. Have all credit bureaus switched to TCD? Not quite yet. Further, this new credit standard does not only pertain to mortgages. From creditcards.com, get ready for some new lingo! Transactor: Avoids interest by paying off cards every month. "High-dollar" transactors who put a lot of spending on their cards may be targeted with rewards offers. Revolver: Makes just the minimum payment and carries a balance from month to month. Partial revolver: Makes more than the minimum payment but still carries a balance. Rate surfer: Transfers balances from one card to another to get the best rate. Banks may develop retention strategies to keep them before they transfer out. Consolidator: Transfers multiple credit card balances to one card or a consolidation loan. Nonactivator: Opens credit cards but doesn't use them. Banks may want to avoid marketing to them. Inactive: Current customers who have stopped using their credit cards. Banks may want to incentivize them to start using their cards -- or drop them as customers. Seasonal user: Uses the card at specific times of year. And all of this may be good or bad, especially depending on your perspective. Here’s one illustration of that from a separate creditcards.com piece. “"I think it's a benefit to know there are consumers who pay off their balances, and who they are," said Linda Sherry, director of national priorities at Consumer Action. "It shows they're more responsible; or rich." I played “Phone a Friend” and asked both an esteemed DE Underwriter and a top Loan Originator about the effects of TCD so far. Shockingly, their responses were similar in nature (and, trust me, that NEVER happens!). Both feel they have not yet observed much change. They said that only 2 of the 3 credit bureaus were using it so far and they believe that might be softening things – to date. In summary, is the use of TCD a glaring illustration of George Orwell’s “Big Brother”?, or is it progress as it should be, or is it surely something that should have been rolled out prior to the mortgage crisis of 2007/08, or do you simply need more stick figure illustrations? What do YOU think? How Long Until Others Follow in Fannie's Trended Data Footsteps?